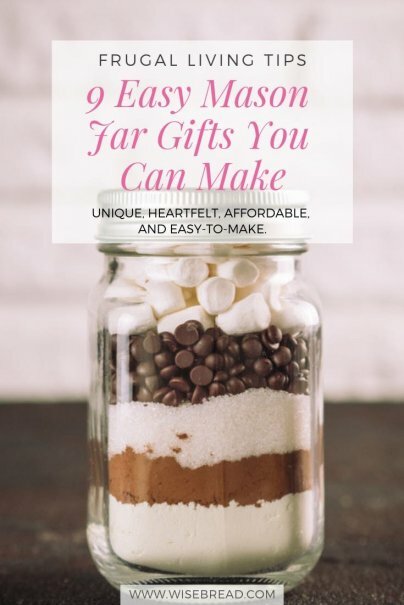 A gift in a mason jar is unique, heartfelt, affordable, and easy-to-make. We've found some of the best mason jar gift ideas that will meet all your gift-giving needs this season. This is the easiest way to gift homemade cookies or other sweet treats. Layer all of the dry ingredients for a recipe inside a mason jar, and simply tie the recipe card to the top. The ingredients will look beautiful stacked up, and the person receiving the gift can just add the necessary wet ingredients when they're ready to enjoy. You can also package completed food items (like cookies) in a decorative mason jar. Get really creative with store-bought goodies, like making snowman and Santa-inspired Oreo and Nutter Butter treats. Canning and jarring may be easy, but most people don't want to invest the time or energy. Consider making a big batch of jam, caramel sauce, chocolate sauce, mulled cherries, or canned preserves so you can share some with your loved ones. One of the many uses of a mason jar includes an impromptu travel snack cup or drink mug. You can decorate the jar however you like, and can even personalize it for the person receiving the gift. You can even craft a hole for the straw so that you can sip on the go. Paint the jar with glitter and mod podge to create unique designs, which can also double as a luminary or pen holder. Add things like twine, wooden labels, ribbon, and buttons for added personality. You can also mod podge things like sheet music or comic books pages around the outside for a truly unique gift. Cover the jar in chalkboard paint instead for some cute vintage flair! Did you know can make candles in a mason jar, which you can scent, color, and decorate in any way you like? If you don't like the idea of pouring hot wax, consider transforming the jar into a glass lantern, decorative luminary, or candle holder instead. Or just fill the jar with a string of small sparkling lights for a unique lighting effect. Mason jars are spacious enough to fit terrariums and even snow globes. Create a whole scene, a scrapbook jar, or an ode to a family memory. You can even use it to house a gift card, which is cute, affordable, and will show that you took the time to create a unique gift. Turn any mason jar into a soap dispenser or lotion container. Fill it with DIY soap, shampoo, body wash, lotion, or other personal items. You can even make your own laundry detergent to use at home or share with your friends. Consider making your own DIY air freshener or simmered potpourri, beautifully housed in a decorated mason jar. You can simmer the potpourri yourself or you can prepare a jar of mulling spices, so the recipient can heat it on their stovetop at home. Some of the best holiday items to simmer include oranges, cranberries, cinnamon, cloves, apples, and vanilla. What are your favorite ways to use mason jars? Please share your thoughts in the comments!